Gaetano Pesce celebrates the 50th birthday of his iconic UP 5&6 first launched with B&B Italia in 1969, unveiling an installation in the Piazza Duomo in Milan that focuses attention on violence against women. Like art, design has always played a role in opening our eyes and teaching us about the world. When the UP 5&6 armchairs were launched in 1969 by Gaetano Pesce and B&B Italia, their soft feminine form protested the subjection of women, and made of specially engineered vacuum-packed expandable foam broke ground both technologically, and as the first Italian design to have such wide-reaching political impact. To celebrate the design’s 50th birthday at Milan Design Week, Pesce and B&B Italia have super-sized UP to create a sculptural installation in Piazza Duomo eight metres high and covered in pink fibreglass that has again sparked debate, making it one of the most popular talking points of the week. This year B&B Italia also made the move to the fairgrounds where they showed new designs by Piero Lissoni, Vincent Van Duysen and Antonio Citterio whose classic Diesis sofa turns 40, and a new table by Michael Anastassiades who has also ventured into the world of Gebrüder Thonet Vienna (GTV) and the traditions of cane and bentwood furniture. Here the Austrian company with its focus on reinvigorating their traditional craft has collaborated with some of the design world’s best including Cristina Celestino and Chiara Andreatti to create a series of new additions that this year includes a range of bedheads. While at Glas Italia the focus was on colour, colour, colour with Patricia Urquiola, Piero Lissoni and Philippe Starck. Parallel table designed by Michael Anastassiades for B&B Itlalia. Photo © B&B Italia. One of the group of original Italian manufacturers who forged a path led by manufacturing innovation and new materials in the 1960s, 2019 marks a year of anniversaries at B&B Italia, with the 50th birthday for the groundbreaking UP 5&6 armchair designed by Gaetano Pesce in 1969, and the 40th year for the classic Diesis sofa by long-standing collaborator Antonio Citterio. While new designs by Michael Anastassiades, Piero Lissoni and Vincent Van Duysen include a series of dining and occasional tables and a beautiful leather chair by Van Duysen that is an innovative meeting point between armchair and chaise-longue. The UP 5&6 armchairs celebrate 50 years marking a long collaboration between designer Gaetano Pesce and B&B Italia and a reminder of the political impact of design. First launched at the Milan Furniture Fair in 1969, the UP armchair was initially made from air sensitive expandable foam and when removed from its flat-pack box wowed the crowd as it slowly inflated. Today UP 5&6 is one of the most iconic chairs in the world and in Milan its image was present everywhere – from the most talked about installation in Piazza Duomo to B&B Italia's Via Durini headquarters, you couldn’t miss it. The Diesis by Antonio Citterio first launched in 1979 is revisited in 2019, updated with new design and structural details. Photo © B&B Italia. The Pablo chair designed by Vincent Van Duysen for B&B Itlaia. Photo © B&B Italia. The fine timber workmanship at Maxalto is highlighted in the Tesaurus storage units designed by Antonio Citterio. Image © B&B Italia. Caccia Dominioni's iconic ABCD armchairs on show at B&B Italia. Photo © B&B Italia. Revisiting the Diesis has given B&B Italia the chance to review and tweak, with the 2019 edition including design and structural updates. The iconic backrest retains its technical integrity based around the structural steel core of metal springs that give strength and flexibility. The leather-covered base and backrest now have a distinctive Saffiano texture. While lovers of design details will appreciate the die-cast lenticular elements of the polished brushed aluminium structure, and the seat structure which is further reduced by using two leather-covered coupled sheets. Last year’s tribute to the late Luigi Caccia Dominioni saw a collection of the architect’s furniture shown inside Milan’s Umanitariain building in a move that highlights why Milan is not only the undisputed capital of architecture and design but the city that allows you inside some of its most private spaces. Now 60 years since they were first designed and known as the “Caccia style”, B&B Italia has signed an agreement to produce a collection of Caccia Dominioni's iconic pieces, including the very classic ABCD armchairs on show. 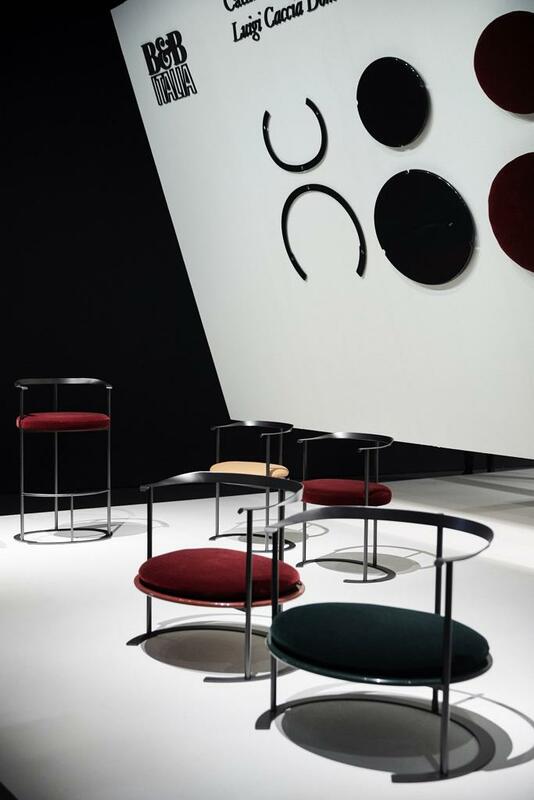 At Gebrüder Thonet Vienna classical materials and forms from the group's Austrian heritage are underpinned by new creative interpretations embracing the brand's artisanal workmanship and industrial production. The new N.200 chair designed by Michael Anastassiades is a highlight from the collection and celebrates the 200th anniversary of the their first joinery workshop opened in 1819. It is a chair that embodies the Gebrüder Thonet Vienna style, but with a twist, in what the company describes as a "deep vocation for design innovation". The N200 chair designed by Michael Anastassiades celebrates 200 years since the Michael Thonet’s first workshop opened in Vienna. The Glas Italia installation at the Milan Furniture Fairgrounds featuring the sliding crystal glass wall unit. While at Glas Italia the focus was on colour, colour, colour with Patricia Urquiola, Piero Lissoni and Philippe Starck, while George Yabu and Glenn Pushelberg were inspired by the organic form of an oyster shell to create the fluidity of the Nacre coffee table's asymmetrical form. It’s spatial lightness evokes the feeling of continual movement and connects to one of the key themes of Milan Design Week this year, the natural environment. The fluid form of Nacre designed by George Yabu and Glenn Pushelberg for Glas Italia. LA Sunset by Patricia Urquiola for Glas Italia. Another highlight of the collection is LA Sunset designed by Patricia Urquiola. First released last year in blue, this low, round table with its tubular metal structure is now finished with a specially formulated copper metallic surface. While the laminated glass top, on a mirrored background, blends a palette of colours that mix with one another like a gas or fluid. Like the organic form of the Nacre table, here the solid state of the material is caught in perpetual motion. B&B Italia, GTV and Glas Italia are available exclusively from Space – Australia – and Space – Asia.